There’ stunning silence from Motorola since the launch of Moto G6 series in Brazil last month. However, the company has started teasing the Moto G6 and Moto G6 Play smartphones as launching soon in India since last week, but the launch date was unknown until now. 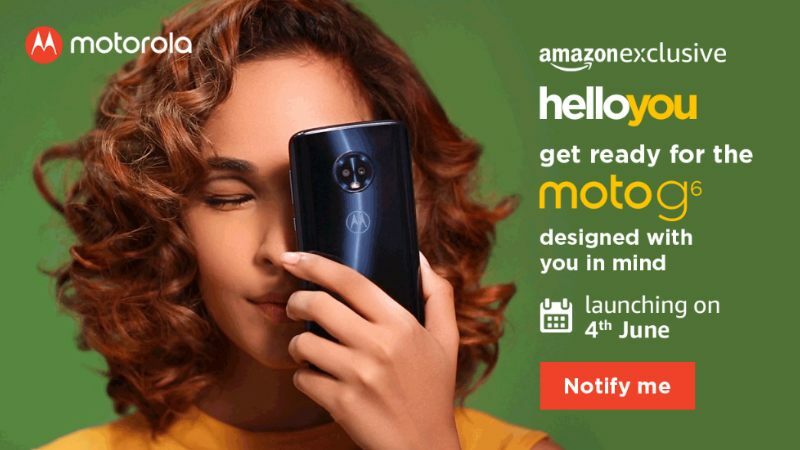 E-commerce portal, Amazon India which will be selling the Moto G6 exclusively has listed the device as launching on June 4, which is a good two-weeks away from now. Also, the Notify Me button is live on Amazon, so if you’re interested in the Moto G6, hit that button and get updates directly to your mailbox. It is unknown whether the Moto G6 Play will be launched at the same event or not. Rumours hint at an early launch for the G6 Play and it could be exclusive to Flipkart. The Moto G6 was officially launched in Brazil last month with decent specifications on board. The Moto G6 boasts of glass sandwich design, same as the Moto G6 Plus and Moto X4. The front of the phone is dominated by a 5.7-inch Full HD+ 18:9 display, packing a resolution of 1080 x 2160 pixels. At the heart of the phone, we have the Qualcomm Snapdragon 450 chipset, mated with 3GB/4GB of RAM and 32GB/64GB of internal storage. A microSD card slot is also present which can take up to 128GB cards. The Moto G6 measures 8.3mm in thickness. The device runs Android 8.0 Oreo out of the box and Motorola has already confirmed it will not be providing any monthly security updates to the smartphone, instead, it will offer security patch updates for three months. Optics wise, the Moto G6 has a primary 12MP sensor at the back, accompanied by a secondary 5MP depth sensor and dual LED flash. A 16MP selfie shooter is present on the smartphone along with a flash. The phone is backed by a 3000mAh battery with fast charging support. It comes with a 3.5mm headphone jack and USB Type-C port at the bottom. The Moto G6 is priced at $249 (approx. Rs 16,600) in other countries, but in India, it could start at around Rs 12,999 or Rs 13,999 mark. The Moto G6 Play will retail for around Rs 10,000 mark, but there’s no confirmation from Motorola on the same. More details about the smartphone will be available in the coming days.